Our first custom run of discs are in! This is what 100 discs look like! The kids will get their discs handed out at practice on Saturday. 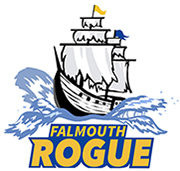 Our first Falmouth Rogue disc design! Check out the design for our first run of custom Falmouth Rogue discs! Registration for the 2017 season is open! You can now register your player for the 2017 season. Click over here to do so. Note: Deadline is March 15th, so don’t delay!